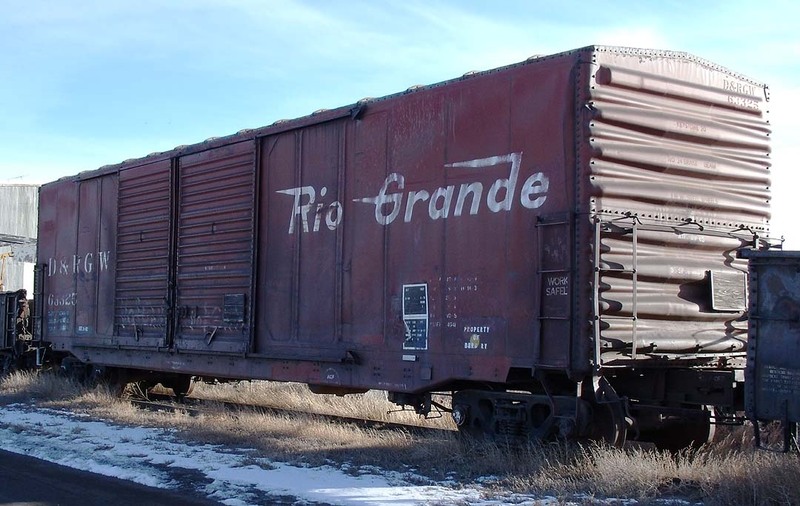 Here is a sampling of some Rio Grande rolling stock. These are latter-day survivors, for the most part, either still working for UP or SP, or stored unused. Scroll down for various types. 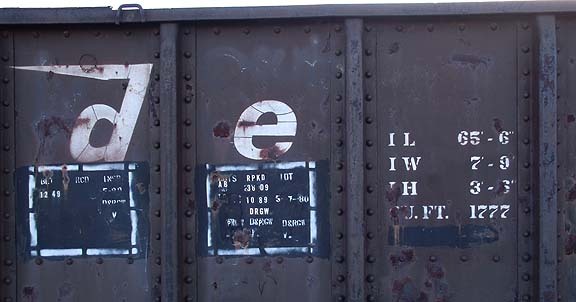 Lettering and stencils differed between groups, and was adjusted over time. 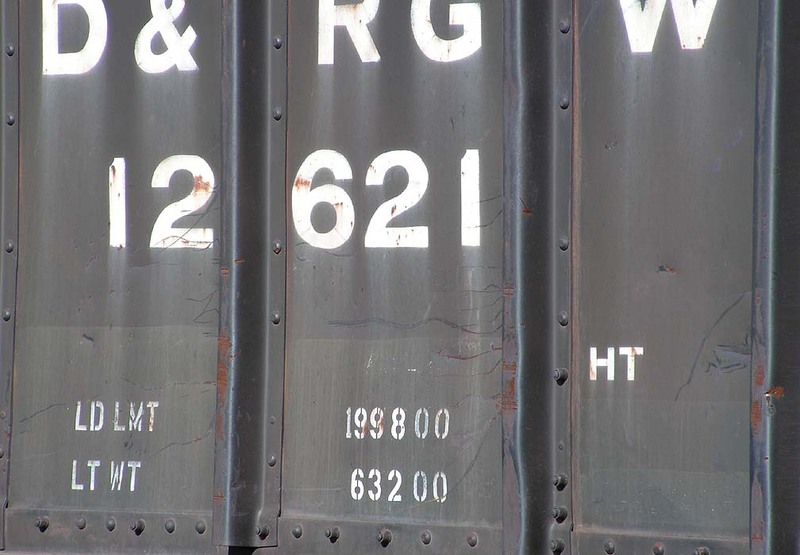 Particularly, the capacity data was simplified in later years, and various lettering was restenciled after painting on some cars. Here are a few close-ups, taken in December 2009. Many of the modifications are visible upon close inspection. Quad hopper 12049, at Alamosa (12/28/2009). 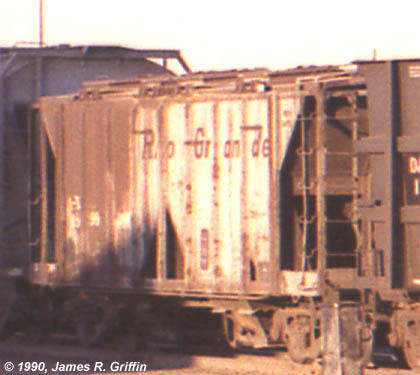 Quad hopper 12621, at Alamosa (12/28/2009). 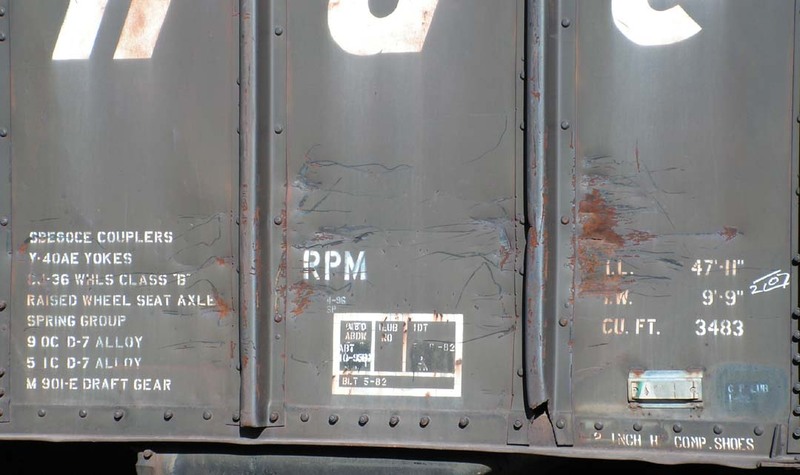 All the paint is in pretty good shape, especially as compared to its contemporary brothers. Quad hopper 12848, at Alamosa (12/28/2009). in Grand Junction on 8/2/1998. Quad hopper 16176, at Alamosa (12/28/2009). Quad hopper No. 16444, in Denver on 7/29/2007. It was built in mid-1971.BOTTOM: Top view of No. 16444, showing the angle-iron reinforcers on the top edge on all four corners. The later quad series didn’t have this feature. This view also gives a good look at the internal bracing. Quad hopper No. 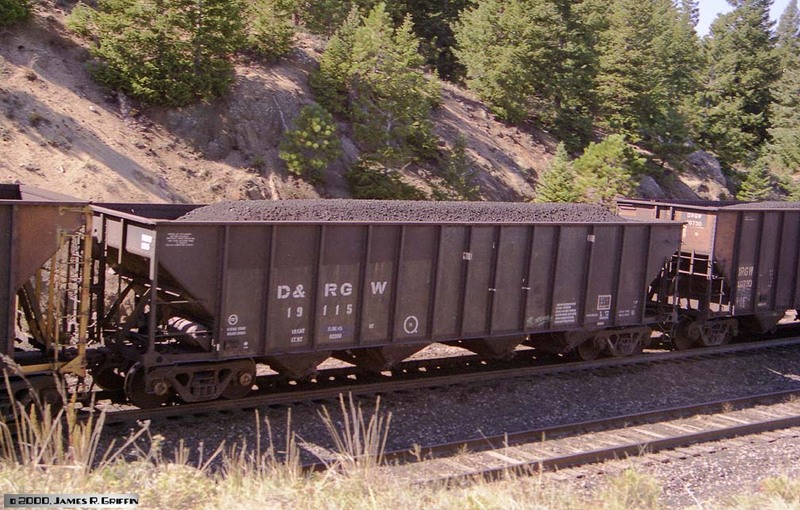 16996 on the MRODV, 11-25-2000. This one is showing its age a bit. Note the reinforced top edges, per the photo above. Quad hopper No. 16778, also westbound at Rocky on Dec 6, 2008. 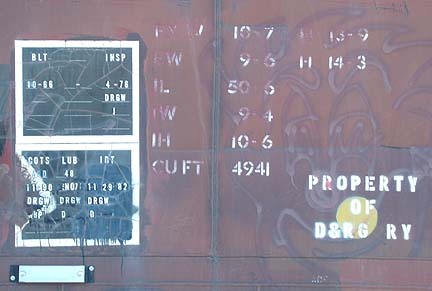 It shows the effects of tagging, as well as being relettered at some point. 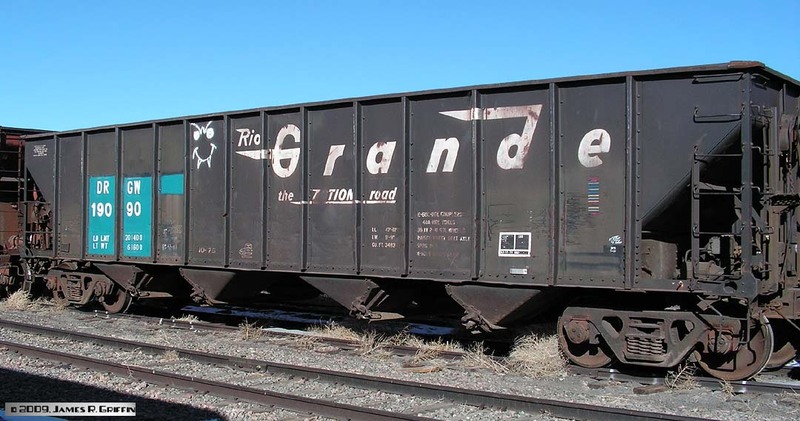 The Rio Grande herald has been mostly painted over, but one can still see where the swooshes on the “G” and “d” crossed over the ribs, as well as the underline below “the Action rail road” legend. interesting re-stencil jobs I’ve seen, the blue paint is strikingly out of place. Quad Hopper No. 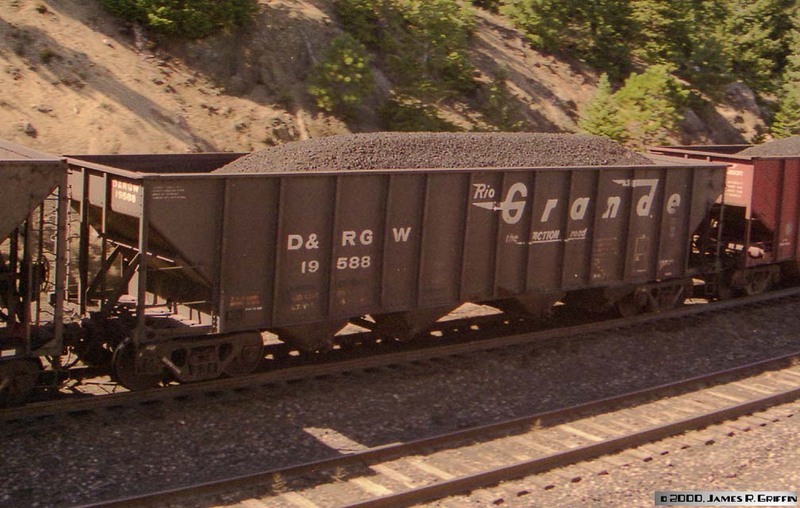 19115 on an eastbound coal train at Crescent, 10-09-2000. 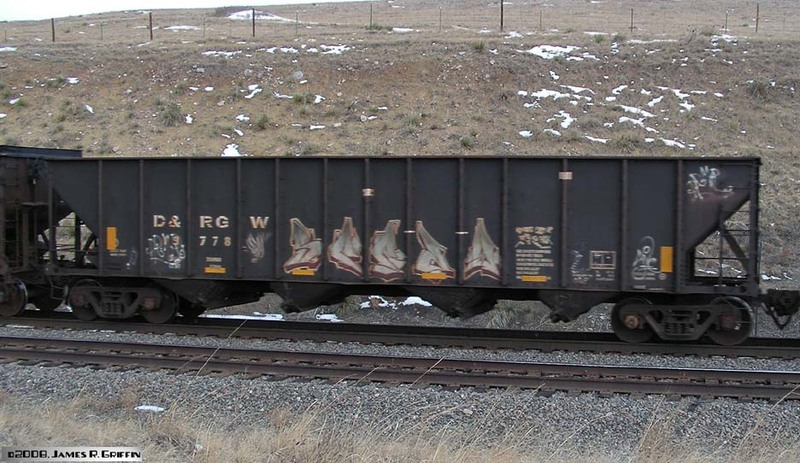 Note the car to the right– it’s a second-hand DRGW hopper.Built October 1975. Note that, as with all cars built late 1971 onward, it lacks the angle-iron reinforcers on the top corners. Quad hopper 19133, at Alamosa (12/28/2009). 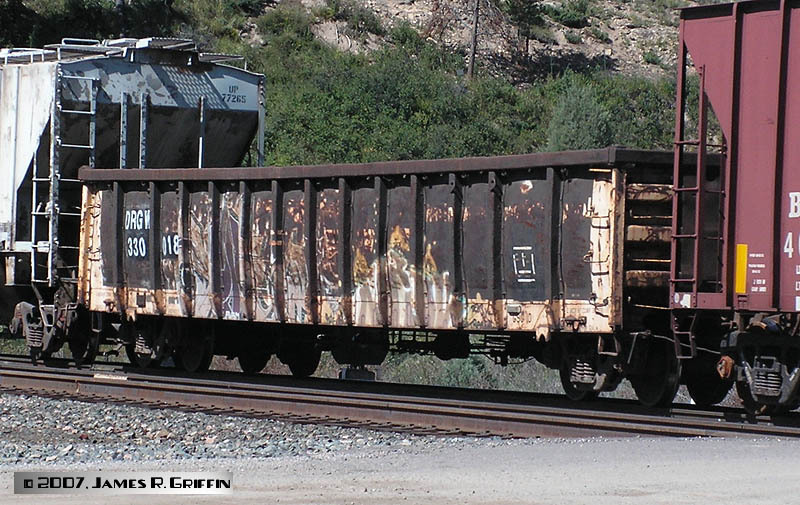 Quad hopper 19174 (two views), in Grand Junction on 8/2/1998.Built October 1975, nearly 23 years old in these photos and still looking pretty decent. Quad hopper, No. 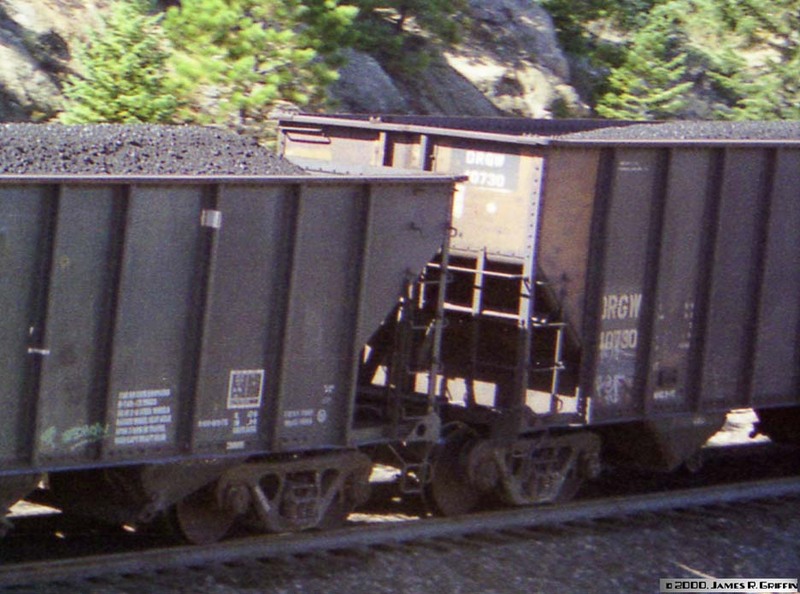 19588, on an eastbound coal train at Crescent, 10/09/2000. Quad hopper 19663, at Alamosa (12/28/2009). 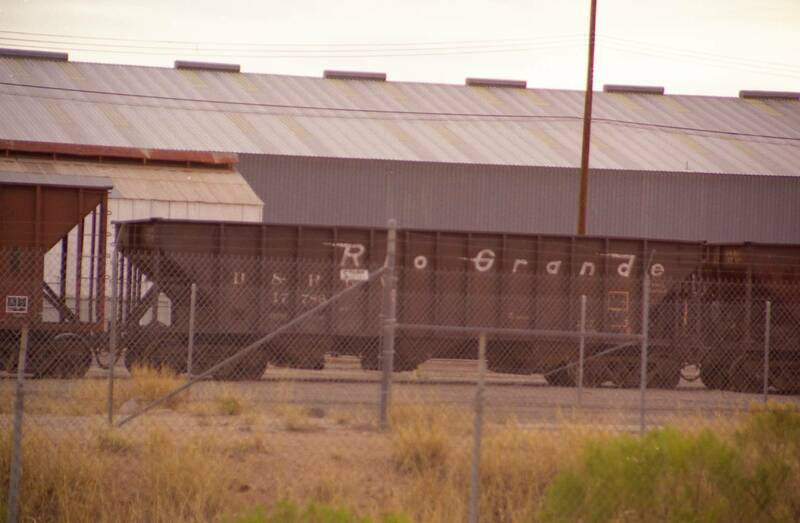 You can see a couple of remnants of the Rio Grande herald, where it had crossed the ribs. See here for an end view. Note the slope sheet bracing, especially the two angle-iron stays. No. 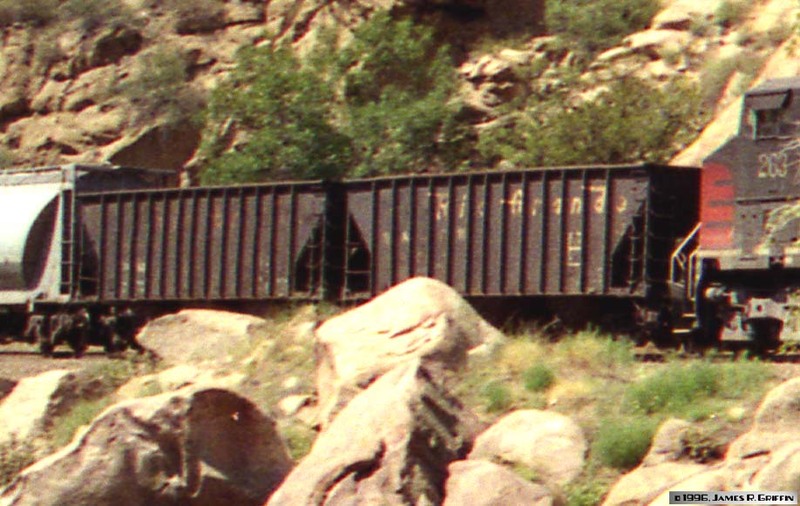 17786, a 70-ton triple hopper, seen at Tucson in March 2000. 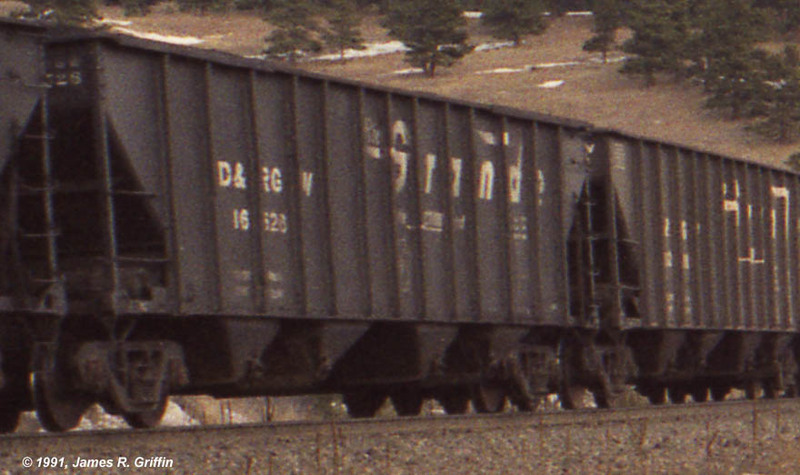 A pair of 70-ton triple hoppers, likely in the same series as the photo above, on the head end of an eastbound SP train at Cotopaxi on 8/18/1996. 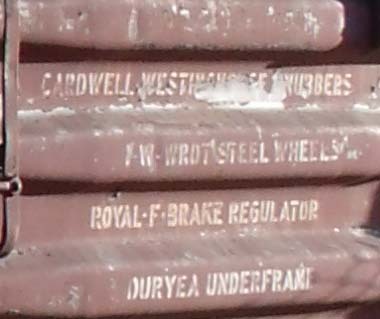 The photo is a tad grainy (it’s a detail from a larger image), but it still shows the general appearance of these cars after nearly 35 years of service. 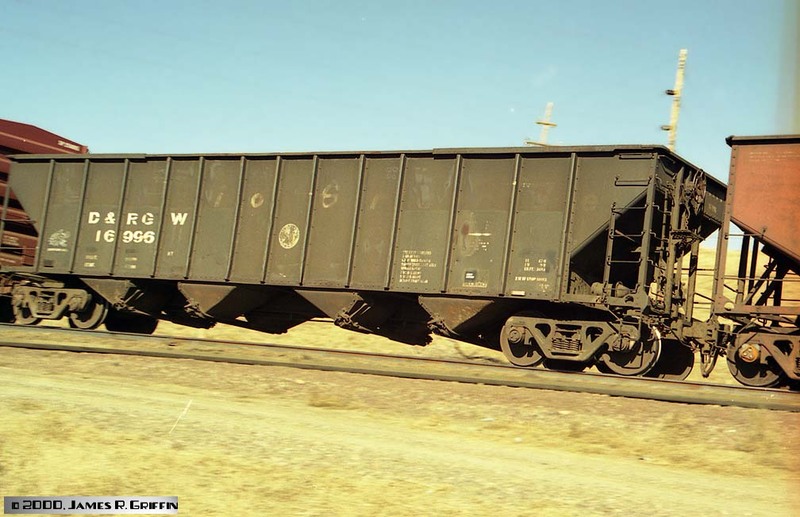 Second-hand triple hopper No. 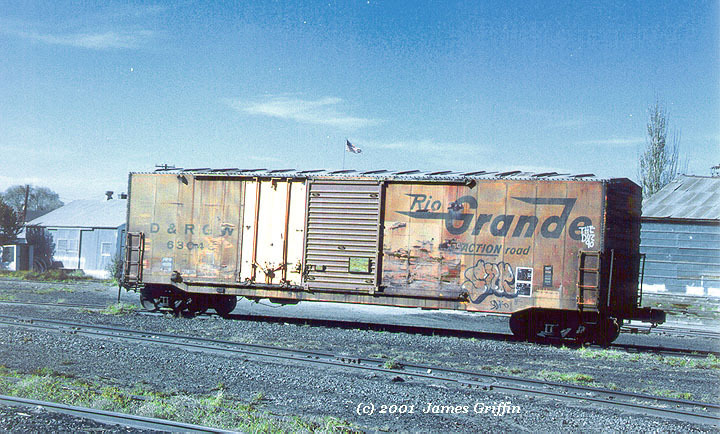 7107, seen in Grand Junction on 8/2/1998. This car and its mates were acquired after the SPL merger, 1991. On the right, a second-hand triple hopper. No. 40730 was one of a batch of such hoppers acquired in 1992 from AEPX via HELM. It’s shown here at Crescent on 10/9/2000.The car on the left is DRGW No. 19115, shown above. Two views of second-hand triple hopper No. 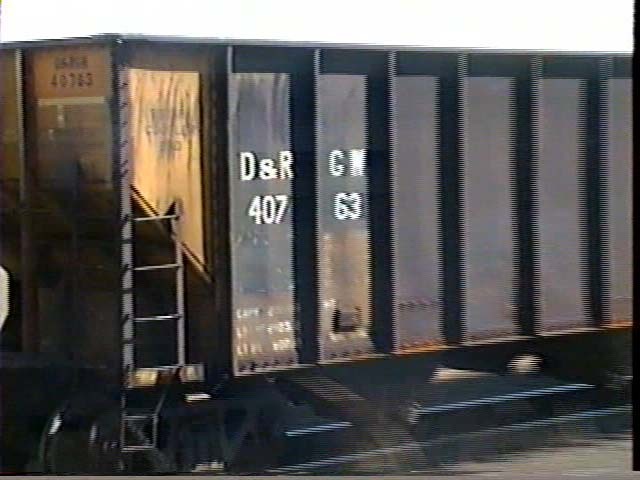 40763, captured from camcorder video. 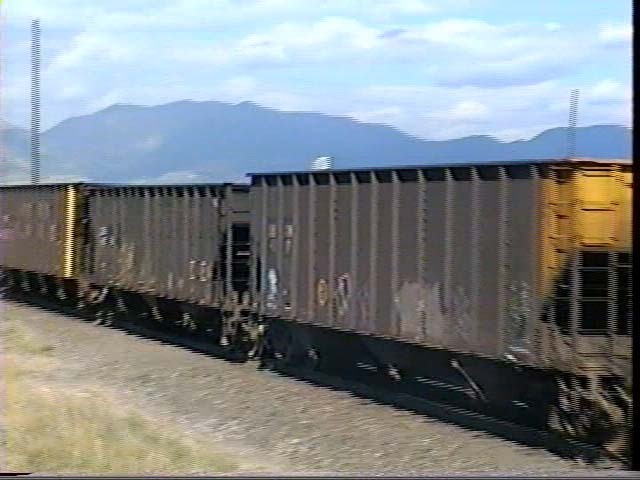 Here the car is rolling empty through Leyden on 9/04/1998. Also note the end of one of the unusual UP repaints on the right. 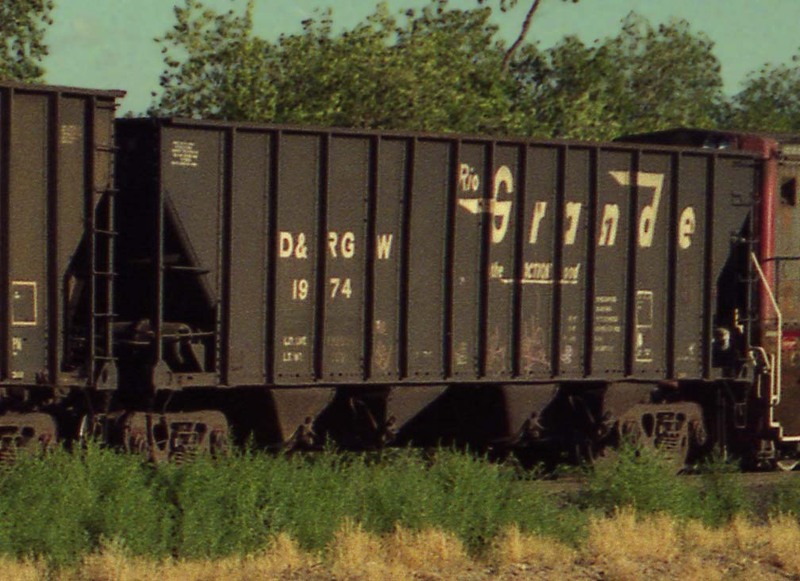 This car is painted Oxide, but is lettered for DRGW and Union Pacific. UP did this with a few cars to protect trademarks. 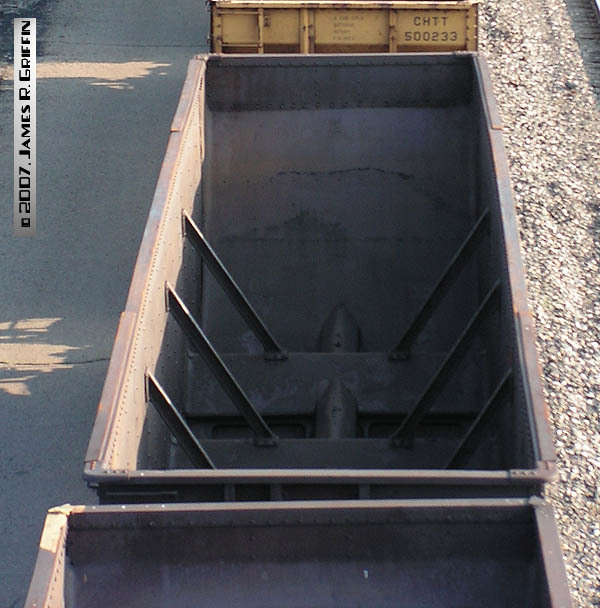 Two views of second-hand triple hopper No. 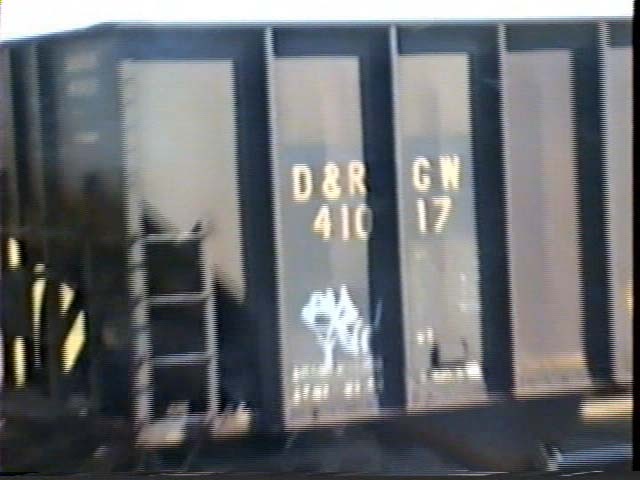 41017, captured from camcorder video. 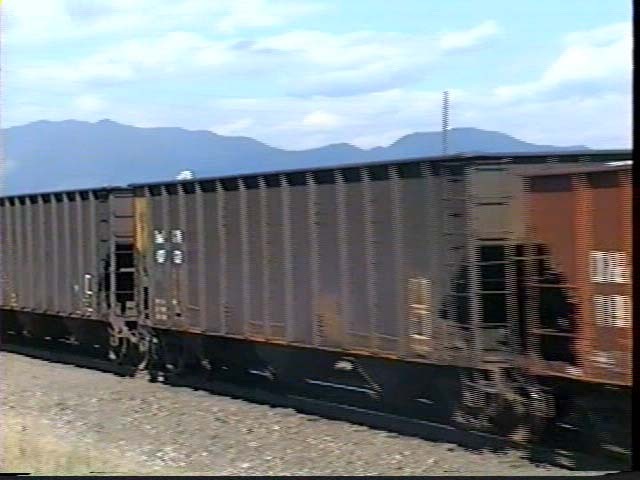 Here the car is rolling empty through Leyden on 9/04/1998. 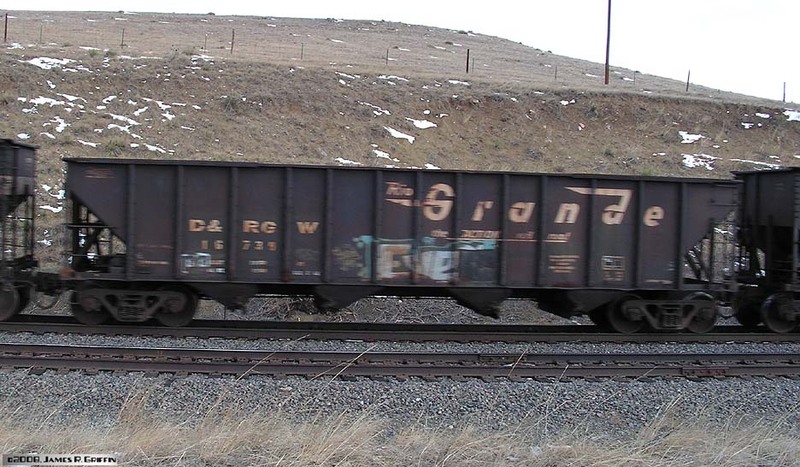 Second-hand Thrall gondola in Denver, November 1990. 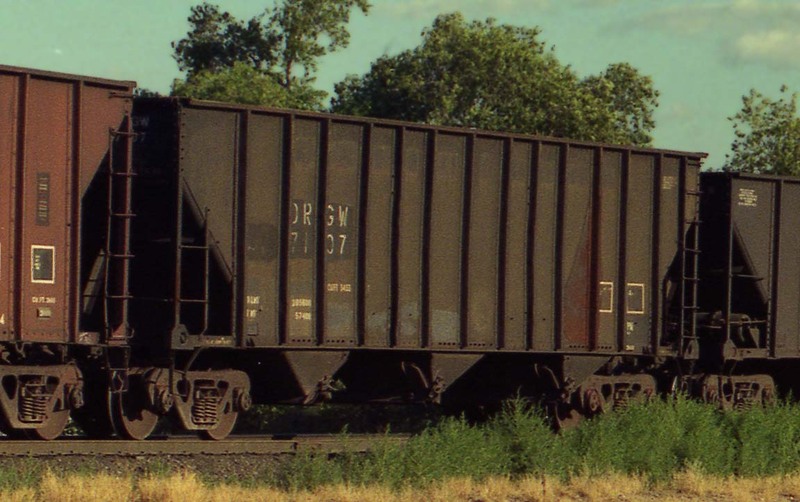 It’s probably one of the series 13103-13186 ex-GSCX cars, per Jim Eager. 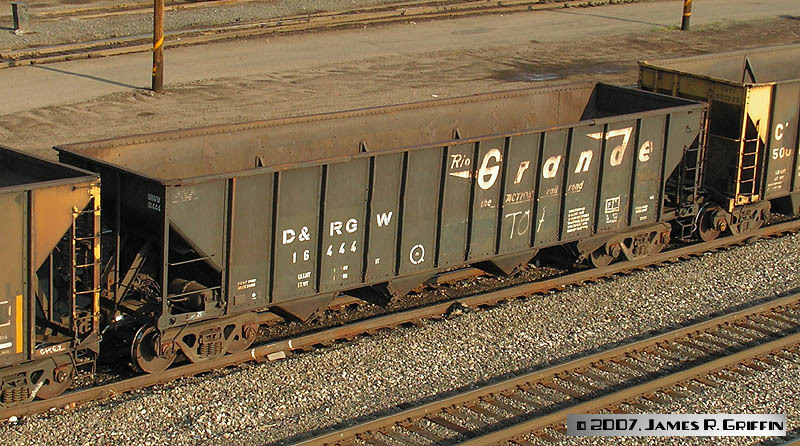 Box Cars, Gondolas, Covered Hoppers, etc. 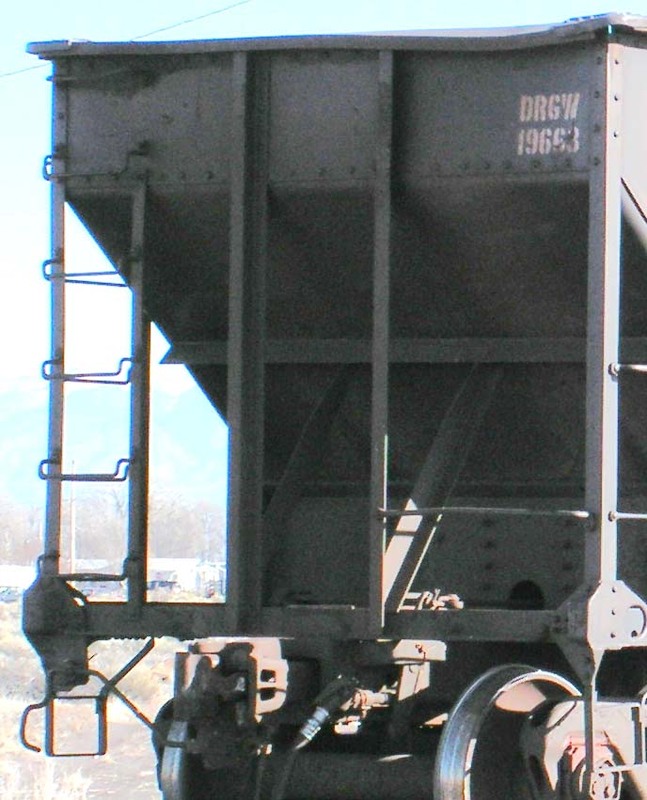 Built April 1968.Top view: At Alamosa, 10/20/2001. 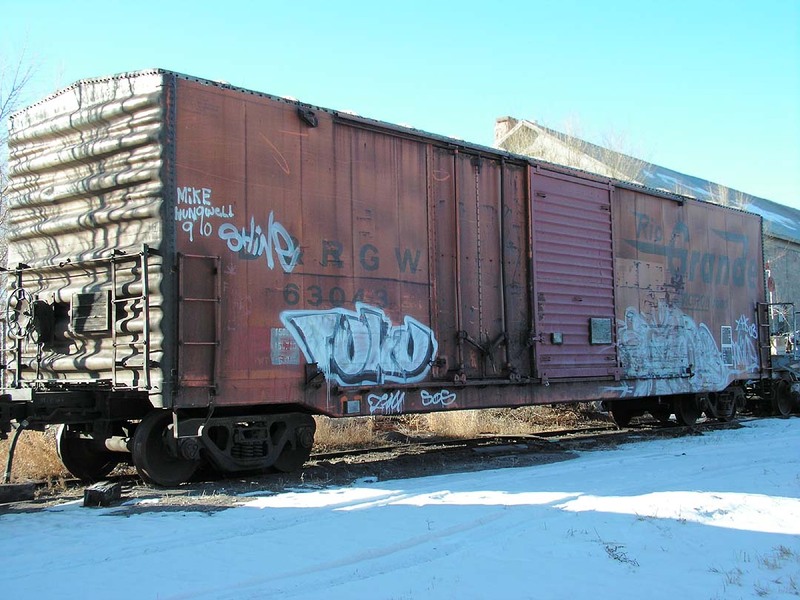 Double-door boxcar 63325. Built in 1966, this order was delivered in Mineral Red for some reason. It’s stored in Monte Vista west of highway 285 behind Monte Vista High School. dimensional stencils on the right-hand side of the doors. from the left side of the car. 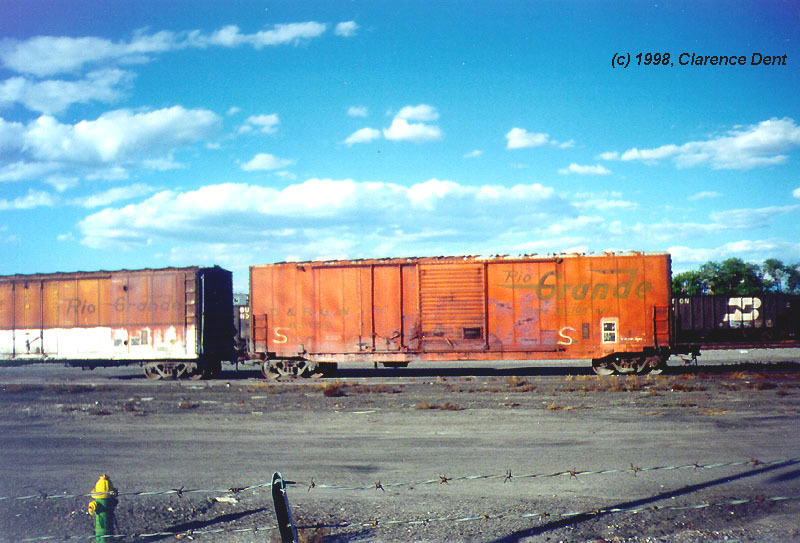 Two Boxcars at Grand Junction, 8/2/1998. 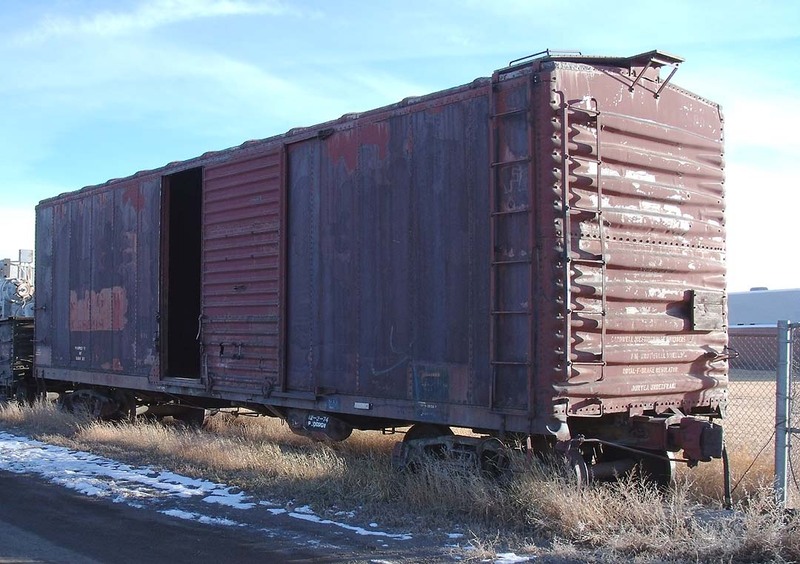 Double-door Boxcar No. 63765, at West Portal (8/8/2007). This car and No. 63797 have been spotted on the spur track here for many years now.Built 1963. 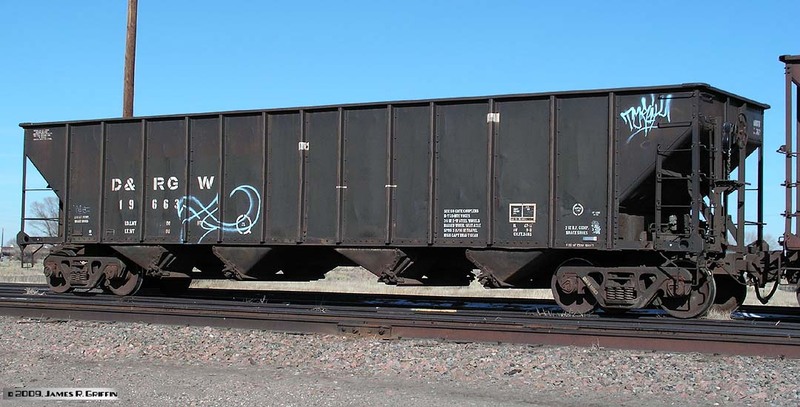 Boxcar No. 63797, at West Portal (8/8/2007).Built 1963. 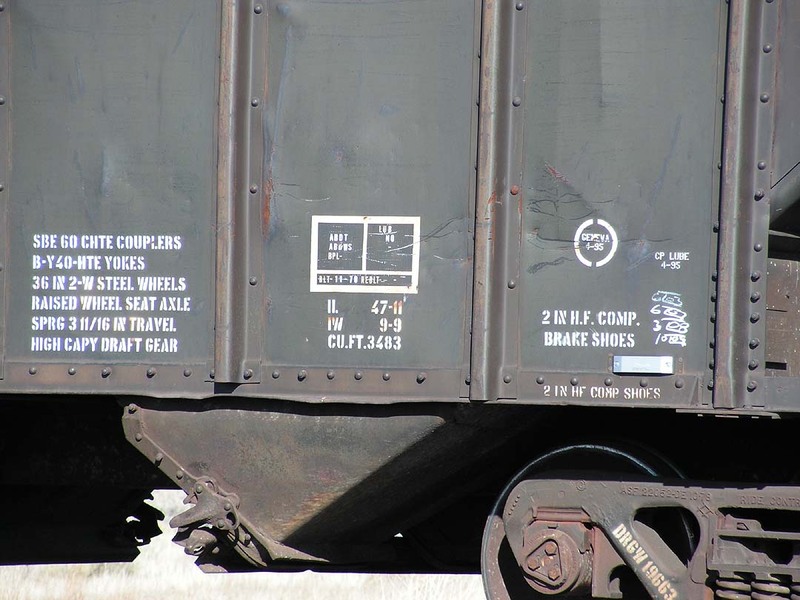 40-foot Boxcar 68398 (lettered for company service, AX). 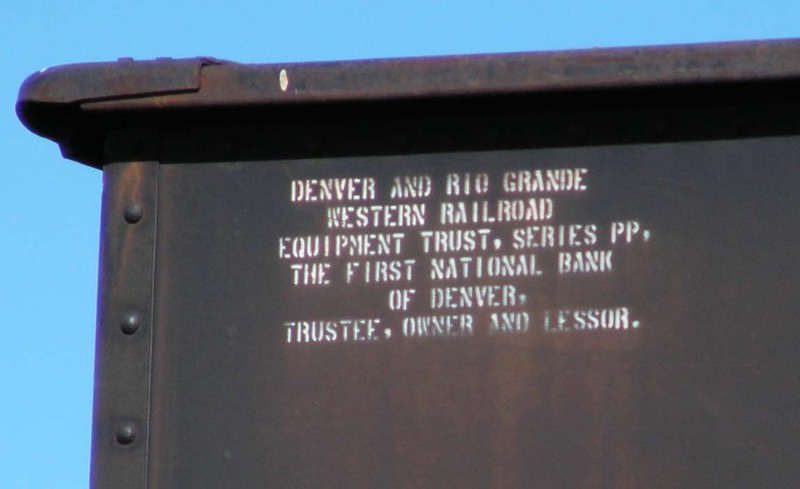 Built 1939, it’s now stored in Monte Vista, CO. (12/27/2010)Top: A end and side. There is a little paint left on this side. Covered Hopper No. 15081 — Seen in Alamosa at dawn, 3/07/03. 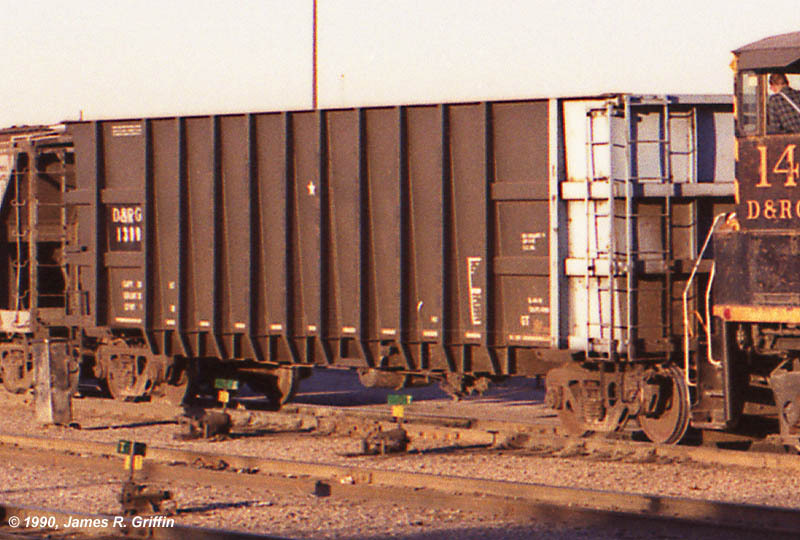 Covered hopper, at Denver North Yard in November 1990. 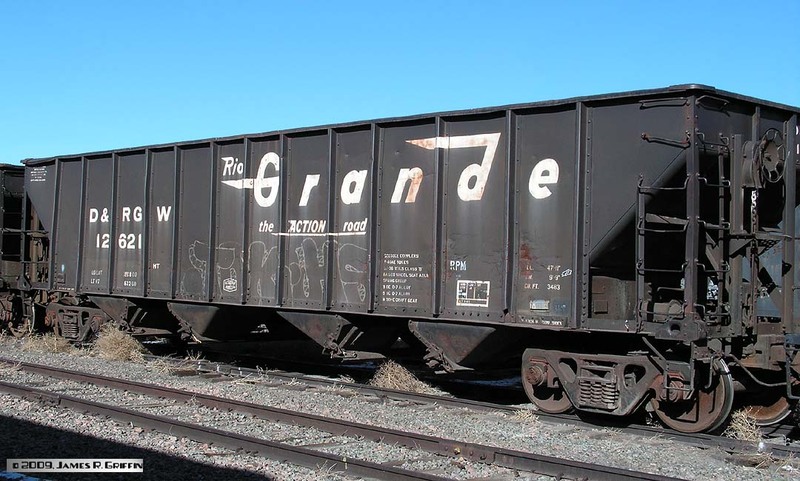 It’s either an ACF or Pullman 1,958 cu.ft. 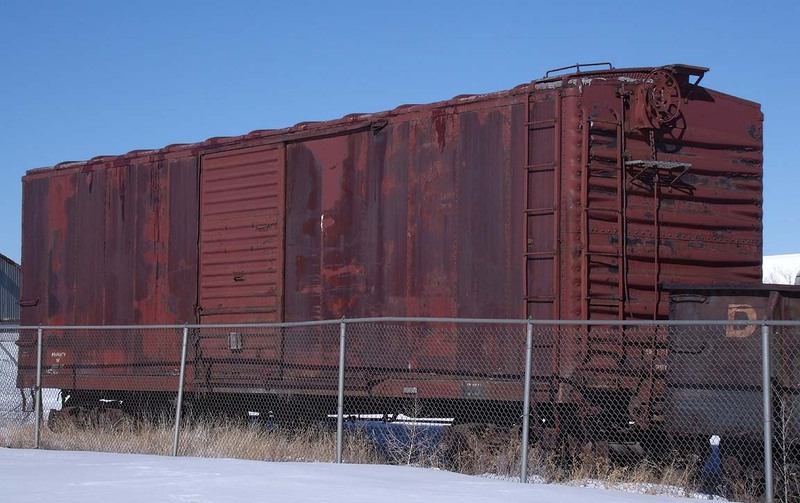 car from the 18375-18475 series, per Jim Eager.Built between 1949 and 1953. Here is the COTS Stencil and dimensional data. Second-hand gondola No. 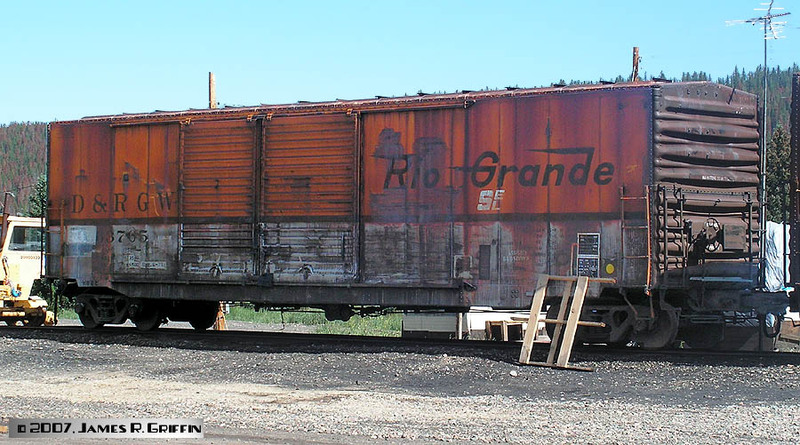 330018 (acquired from Railgon in 1987), seen at Sulphur on 8/8/2007. 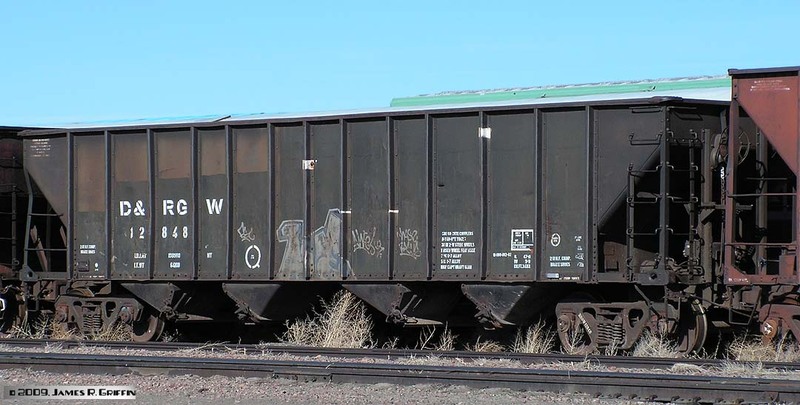 53’6″ Flatcar 23044. 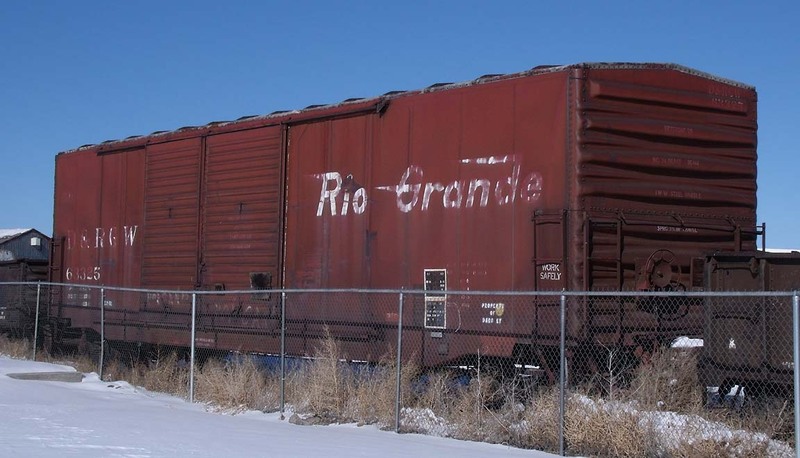 Built 1956, it’s stored in Monte Vista. (12/27/2010). Here is a detail showing all the lettering (adjusted for perspective) .